The Widmer R-3-S Check Signer is easy to use, with the simple action of inserting the check triggers the electronic printing and no handle to pull or buttons to push. 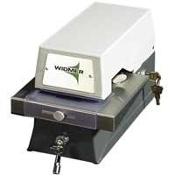 The Widmer S3 Check Signer is easy to use, with the simple action of inserting the check triggers the electronic printing and no handle to pull or buttons to push. Save time, save money, and improve security with WySign: the simple, secure solution for automated check signing.